The Kindness Rocks Project, a national movement started by Megan Murphy (www.thekindnessrocksproject.com) inspired the Art Committee at Curie Elementary to create their own version of the Project. Ms. Murphy encourages people to leave rocks painted with positive messages for others to discover as they travel through their daily lives. 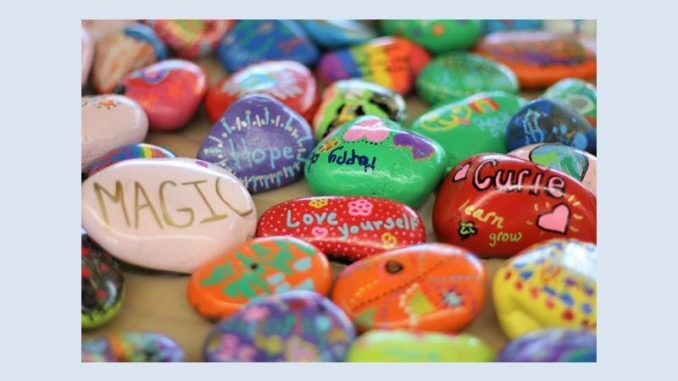 During the month of April, every student, teacher, and staff member at Curie Elementary decorated their own rock with cheerful words, phrases, and colorful pictures. In the coming weeks, our beautiful rocks will be used to make a rock border around our Library Garden. If you’re on the Curie Elementary campus around the end of May, please check out our own Kindness Rocks Project! The Art Committee would like to thank all of the teachers, staff, and students who participated in the Project, in addition to the parent volunteers who generously gave their time, everyone who donated Sharpie paint markers, Diane Stockton of Clairemont and Southwest Boulder and Stone for donating over 600 rocks, and Home Depot for donating spray paint. Kindness Rocks!